with mini-figures and command cards. the player will command 3 Servants and combat other players. and we will go over both here. A figure that is used to indicate a Servant's position on the map. A card that has the Servant's information. 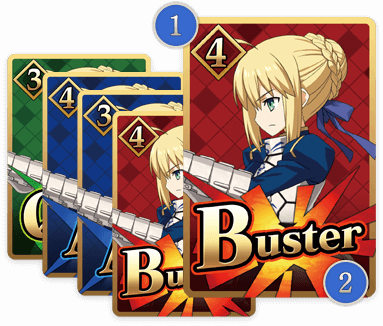 The five-card set that comes with each Servant. Only applicable for advanced rules. All the required cards and figures will be placed on the play sheet prior to each game. Please download and print out the playsheet from the official website. The play sheet that contains all the areas is called the map. Tokens used for counter indicators. Carefully cut out the tokens from the board and use them for the game. 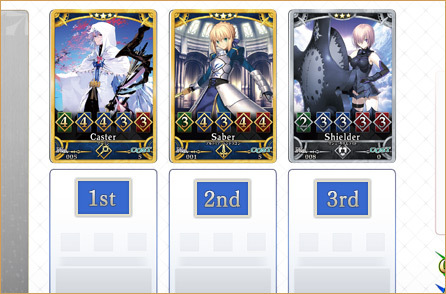 each Master will command 3 Servants (3 sets of figures/status cards/command cards). These 3 Servants will be your party. Please follow the rules the form your party. ・You may not include Servants with the same Servant ID in the same party. 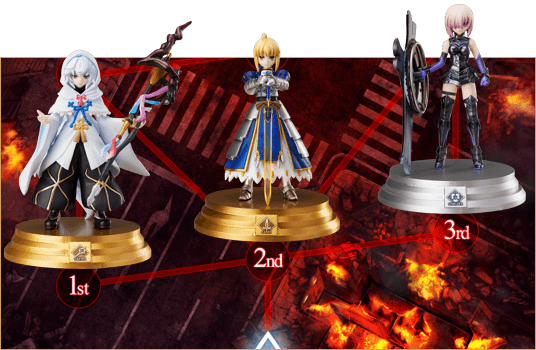 *Gather 3 Servants meaning gather 3 figures + 3 corresponding status cards + a deck of 15 corresponding command cards. *(1) Cost may exceed 11 if both parties agree to the terms. ①Please bring out the play sheet and place it on the table as shown. ②Play rock-paper-scissors to decide who goes first. 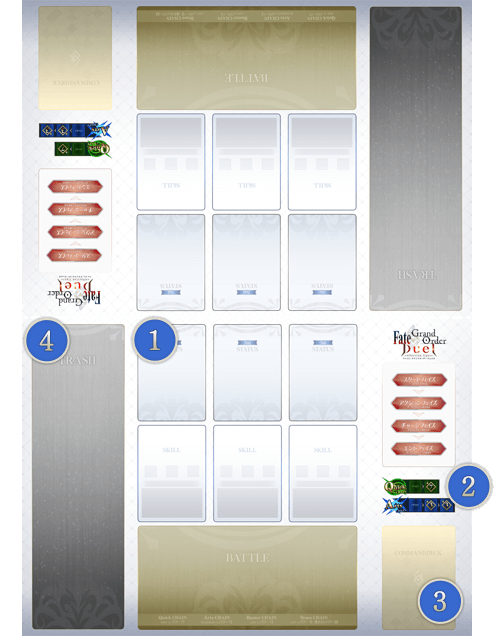 ③Place 3 status cards face up in the STATUS zones indicated on the play sheet. Then place figures in the areas corresponding to the order their status cards are placed in the status zone. These areas are called "Starting Areas". ④Shuffle and place 15 command cards in a pile face down in the zone indicated as COMMAND DECK. Both players may not look at the command deck through the game. ⑤Draw 5 cards from the command deck to form your starting hand. Your opponent may not look at your hand throughout the game. If you do like your starting hand, you may return the cards to the command deck, reshuffle, and redraw your starting hand. This can only be done once per game. The game will start once preparations are finished. ・All 3 opponent's Servants are eliminated. ・Move one of your Servants into the opponent's Master area. ・When the cumulative cards in opponent's hand, command deck, command cards in battle, and trash are less than 4. The players will take turns following each other throughout the game. Each Master's turn ends after End Phase, where they then pass the turn to the opposing Master. Move your Servant to an adjacent area. Choose one of your Servants and designate the area you want to move to. Once decided, place one command card of that Servant from your hand to the trash zone. ・You must move a Servant whenever is possible. ・You may not move to an area occupied by an ally Servant nor your own Master area. 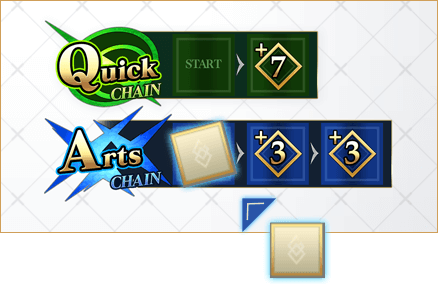 ・If you do not have command cards of movable Servants in your hand, place your entire hand in the trash zone and end your Action Phase. Place cards face-up and verticalljy in the trash zone. You may place them in a cascading fashion to tell which cards you have in the trash zone to make the gameplay smoother. 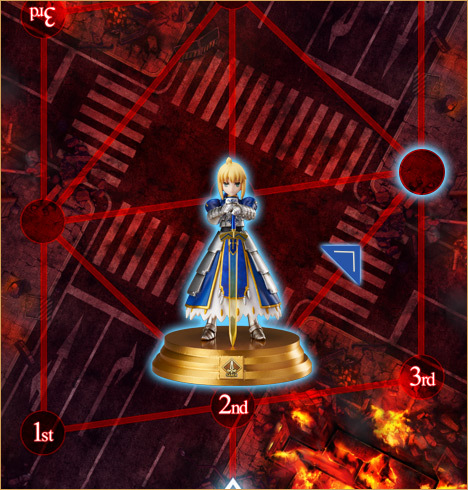 battle will commence between your attacking Servant and the opponent's defending Servant in that area. 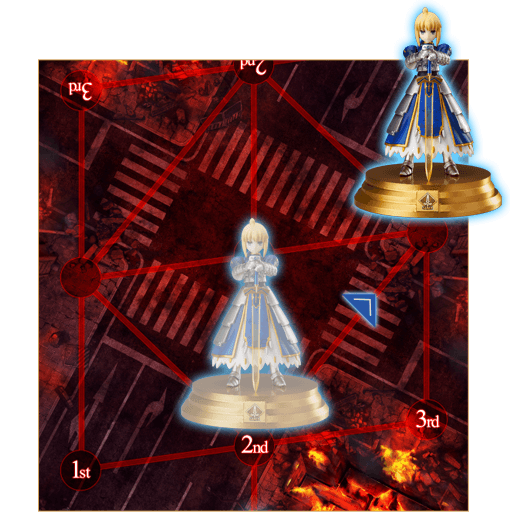 Battle will happen between the Servant (Attacking Side) who is trying to take over the area and the Servant (Defending Side) who is occupying the area. 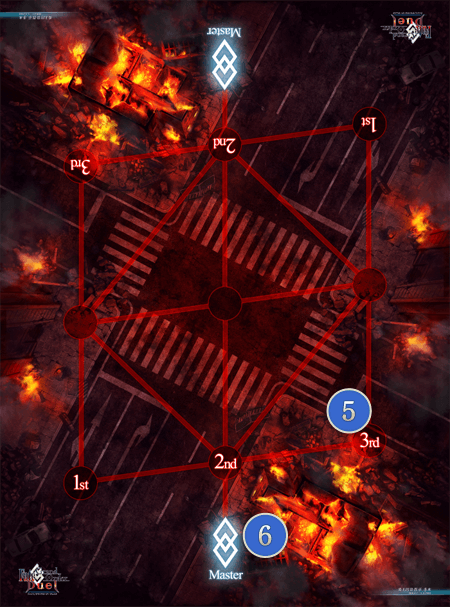 ①Both players will pick 3 command cards from their hands and place them face-down in the BATTLE zone indicated on the play sheet. 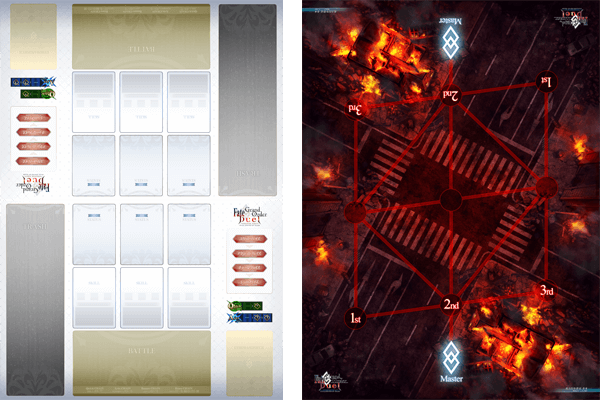 Once the command cards are placed the the battle zone, both players will open them face-up at the same time. Place a counter chip at the start position of the CHAIN counter indicator. Total power +3 at next turn. Total power +3 throughout next two turns. Total power +3 at that turn. For that turn, total power + (the lowest power from the 3 cards). *You do not gain any power bonus during the turn when Quick CHAIN and Arts CHAIN activate. Place the counter chip as so during the turn Arts CHAIN activates. ③Accumulate the total power from your hand and CHAIN bonus. ④The player with the highest amount of power wins the battle. 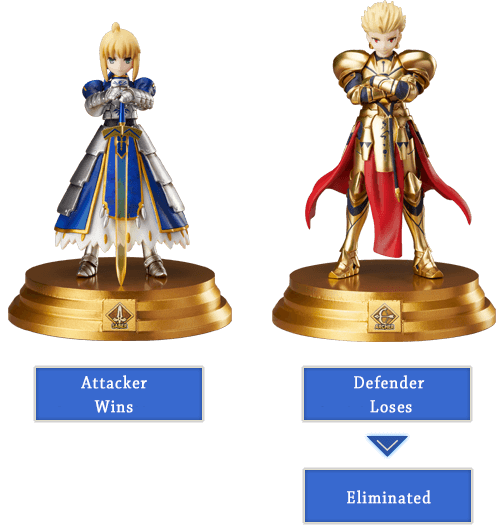 If the Attacking Servant wins, the Defending Servant will be eliminated. If the Defending Servant wins or if the battle ends in a draw, nothing will happen. 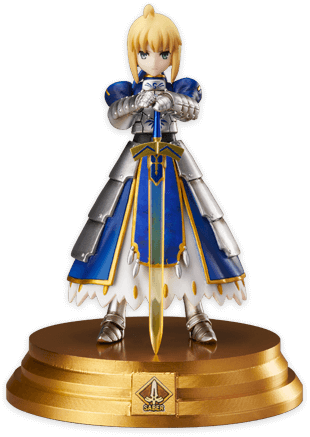 Remove the eliminated Servant figure from the game. *Status cards and command cards will remain. *Please place removed materials outside the play sheet in an orderly fashion. ⑤Place command cards used in the battle in the trash zone after the battle is concluded. Move Servants to an adjacent area. you may move the Servant to that area. 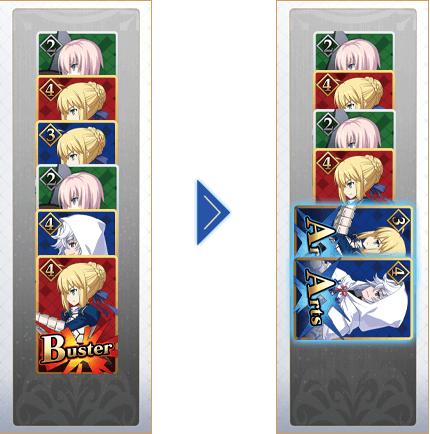 If the moving Servant loses the battle or ends in a draw, no movement will occur. Both players will draw cards from the command deck until they have 5 cards in their hands. If there are not enough cards in the command deck, follow the instructions to make a new deck. ②Reshuffle the remaing cards into a pile and that will be your new command deck. Example 1：If you need to draw 4 cards but there are only 3 cards left in your deck, first draw 3 cards, make a new deck, then draw the 1 card. Example 2：If you need to draw 4 cards and there are only 4 cards left in your deck, draw 4 cards, do not make a new deck and end your turn. Only make a new deck when you have to draw again. Both players will advance their counter chips to the next position. *If the counter chip is already on the right-most position, move counter chip off the CHAIN counter indicator. This marks the end of a player's turn. Both players will take turns following the same process. Here, advanced rules will add skill cards to the gameplay. 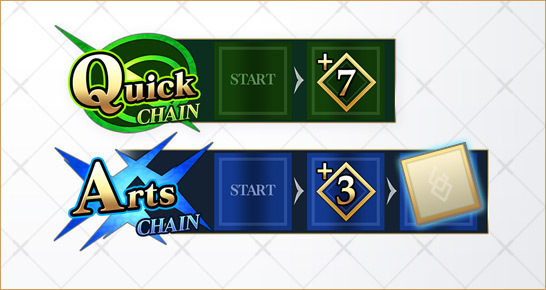 Each Servant will have 1 skill card. 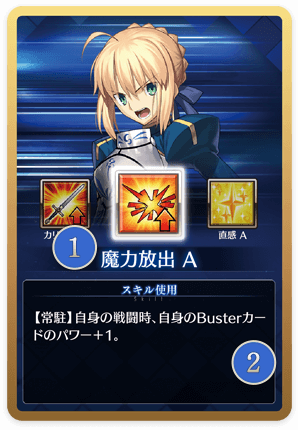 A special ability card possessed by each Servant. 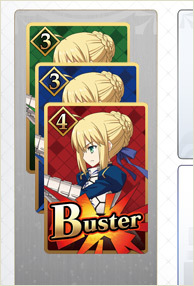 You may only use 1 skill card per Servant per game. Vertical Arts command cards are called "NP" in this game. 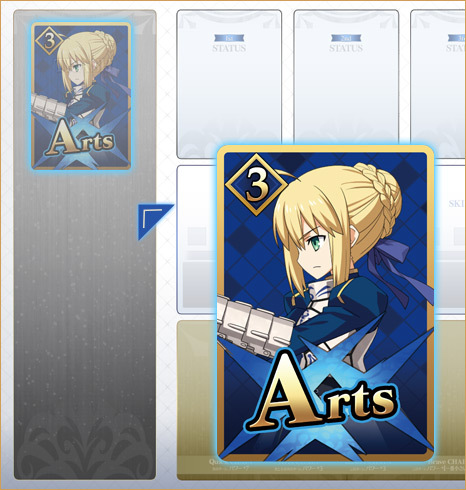 that means X number of Arts command cards must be tapped horizontally. 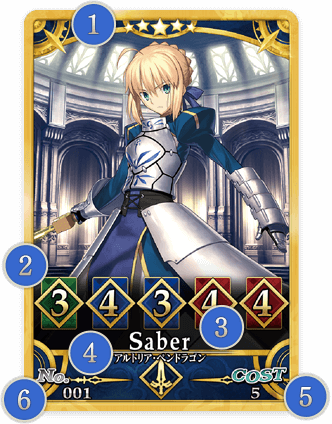 Prepare a skill card for each Servant in your party. Place the corresponding skill cards faced down in the adjacent SKILL zone below each status card. 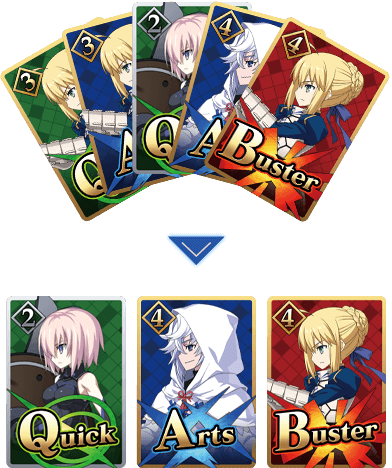 During each turn, a Master may use 1 skill card during the Start Phase. 1. Turn the faced down skill cards face up. 2. Follow the effects and intruction on the skill card. 3. Skill cards are removed from the game after they are used (except for cards that have continuous effects). it does not get removed from the game and it remains on the play sheet. the associated skill card with a continuous effect is also removed from the game. 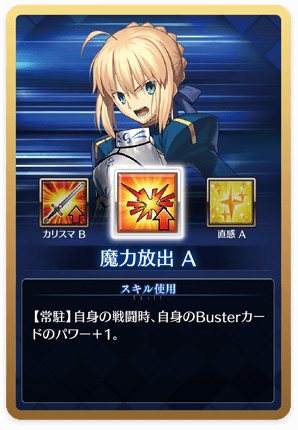 When a Servant is elimited, the associated skill card is also removed from the game, even if the skill card is unused.